Frankly, I do not like to consume alcoholic beverages. I do love them and add to baking or other goodies. After all, home liquors are more useful than from store. All know about dyes and preservatives… In addition, at home there is always the possibility of experimentation. And truly so interesting to mix, cook and wait for what turns out! Everything is actually very simple: mix all ingredients together. I used usual sugar instead of powdered sugar. You can follow the recipe and use powdered sugar. Put this mixture in a water bath and stirring, bring to cream consistency. It takes about 10 min after boiling of water. Therefore pour liquor into bottles and store in refrigerator up to 4 weeks. Wash bottles before use with hot water and dry. If you have vanilla extract or vanilla capsicum, you can add something of them to taste. I do not advise to add vanillin, as nuisance can happen — it can taste bitter. Liquor turnes out thick and of viscous consistency. In fact, very similar to the «Advokat» that is sold in stores. Liquor turnes out yellow, but if you want to add more colors, you can experiment with food dyes. This liquor I use for baking, so next recipes are just addings to this liquor. 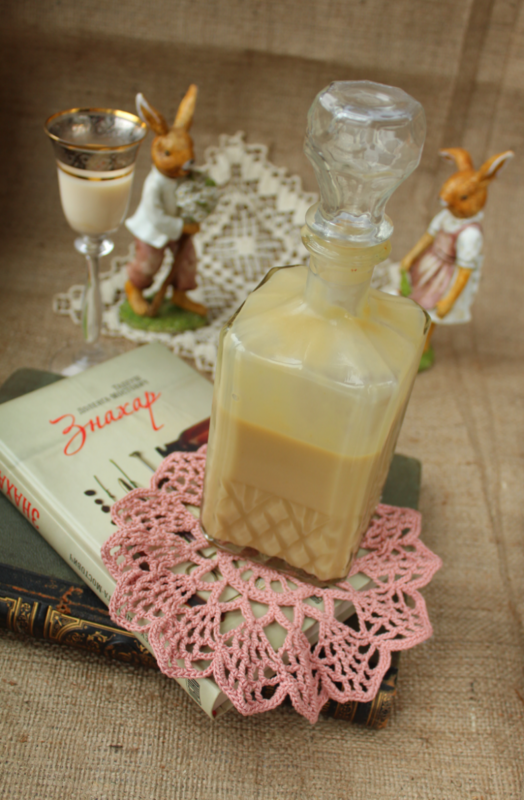 Top of recipe "Homemade "Advokat""
Recipes, Alcoholic drinks, Homemade "Advokat"